We have all done it sometime in our life…. We have compared everything—our husbands, our children, our churches, our cars, our jobs, our homes, our schedules, our finances, our blessings, and our burdens. Admit it! It is what women (okay, I’m sure men do it too) do in an attempt to measure up. It is one of the most dangerous and destructive behaviors that we as women engage in. When we compare our life, our family, our stuff, our failures, and our accomplishments to that of someone else we brew a bitter cup of jealousy and resentment. I will admit that I have drank my fair share of that bitter drink. 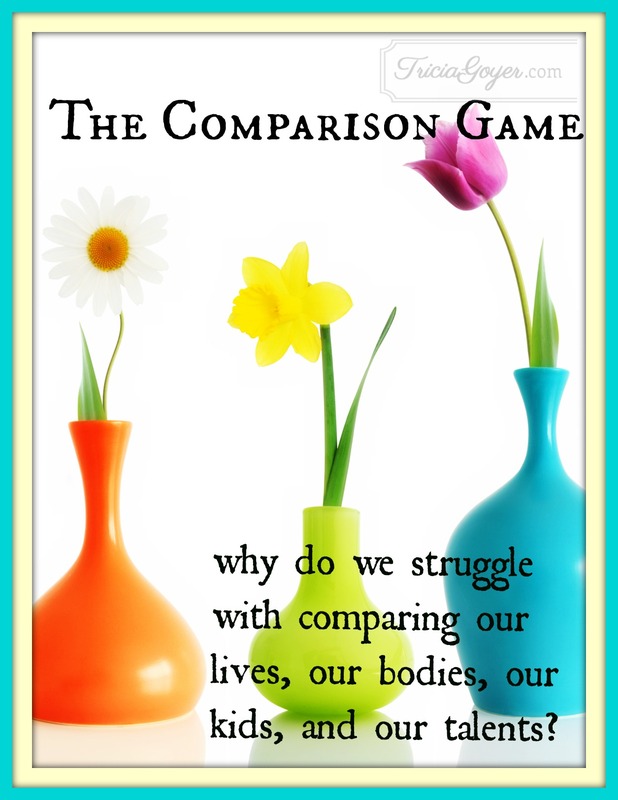 Our comparison is based on just what we see on the outside. Maybe it is all of those “perfect” posts on Facebook. It is like comparing apples to oranges. We know the good, the bad and the ugly of our own situation. Yet, we only know one side of the person that we are comparing ourselves to. It’s easy to listen to the voices (those inner gremlins) that say, “You’re not this, and you’re not that. You don’t do this well, and you can’t do that.” Those inner gremlins would LOVE to get in your face and keep you down. You were made to be you, and are called to be uniquely you. There is nothing wrong with striving for excellence. And being aware of areas in our lives that need improvement is good. God has a plan for each of us and we need to accept that we are right where we are supposed to be at this time. The sooner that we ACCEPT who we are right now, the happier we will be. I’ll admit that I struggle some days. When I struggle, I begin looking for things that I am grateful for. Writing a gratitude list helps to squash those inner gremlins. Believe it or not, even though things in your life appear to be a negative (a divorce, a lost job, an addiction, credit card debt, etc), they can all be something that you can be grateful for. No, I haven’t lost my mind. It is all about re-framing our thoughts and moving forward. For YEARS, I let the inner gremlins take control of my life – beating me up for all of my past mistakes. When I started changing the way that I thought about those things, I slowly stopped comparing myself to others. What about your accomplishments? Can you list them? I have achieved so much in my life and because I was busy playing the comparison game, I missed enjoying some of those moments. I won awards for the work I did as a Social Worker. I raised an amazing daughter. I inspire women every day to look for that little bit of sparkle in their life. I beat drugs and am staying clean for 25+ years. I lost over 100 pounds. I am CEO of my own business. I am fighting MS. I feel so blessed to have made so many connections with like-minded women. When we aren’t playing the comparison game, we are open and ready to welcome new mutually beneficial relationships into our lives. Whether that is to help you grow your business or for personal growth. It’s time we quit chasing the interests of others and start pursuing the passions that were written on our hearts. God wants us to stop trying to measure up to everybody around us and be content in Him. Need some help or just want to talk… reach out, I would love to talk with you.